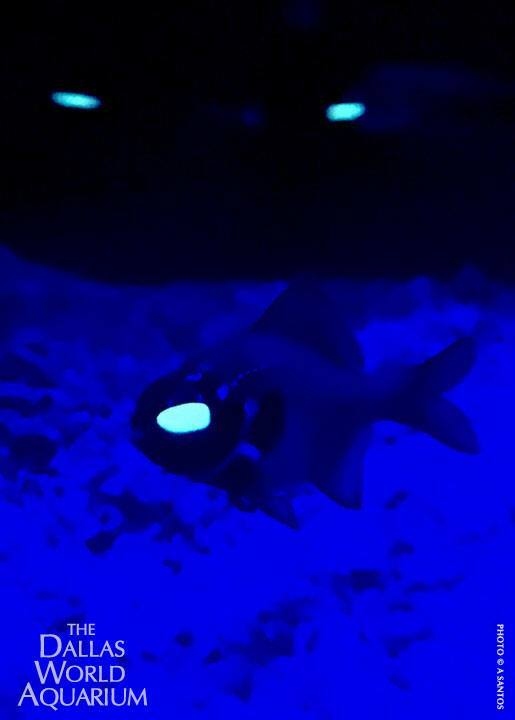 ﻿ DWA Eyeing The Prize of Captive-bred Flashlight Fish! Photoblepharon palpebratus; broodstock Flashlight Fish at the Dallas World Aquarium. “From “behind the scenes” at the DWA: We are excited to announce that we are working hard to raise baby Flashlight fish (Photoblepharon palpebratus) in captivity. The aquarist responsible for them first noticed breeding behaviors in late October. Our adult Flashlight fish reside in the aquarium in the Palau Night Reef exhibit and are best recognized by their photophores (“glow organs”) located below each eye. These organs contain bioluminescent bacteria that have a symbiotic relationship with the fish. “Very little is known about the reproduction and development of these fish, so the aquarists have been working diligently to record as much information as possible. 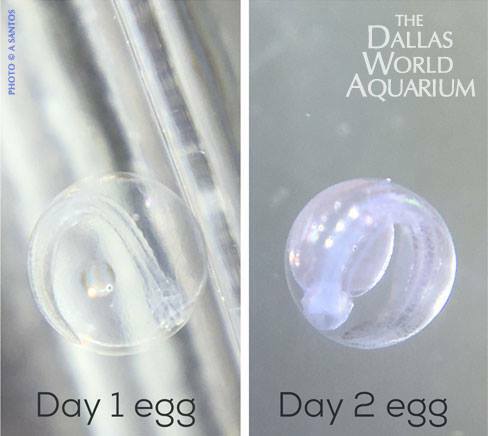 We have observed that it takes about two days for the fish to hatch from the egg. The captive-spawned eggs of Photoblepharon palpebratus. “Once hatched, the tiny larva (just half a centimeter) survives off of its yolk for three days until it develops functional eyes and a mouth. So far, we have had success raising the babies until Day 5. 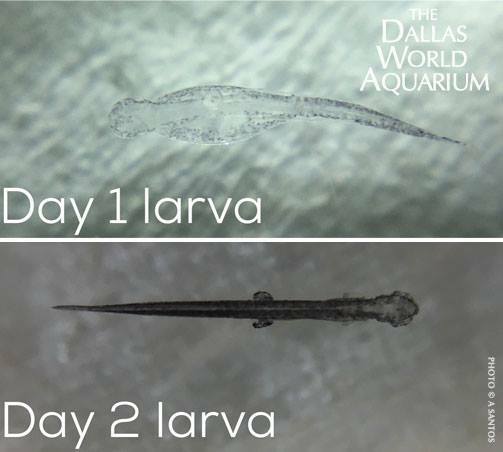 Captive-hatched Photoblepharon palpebratus; the first 2 days of a larval Flashlight Fish’s life. 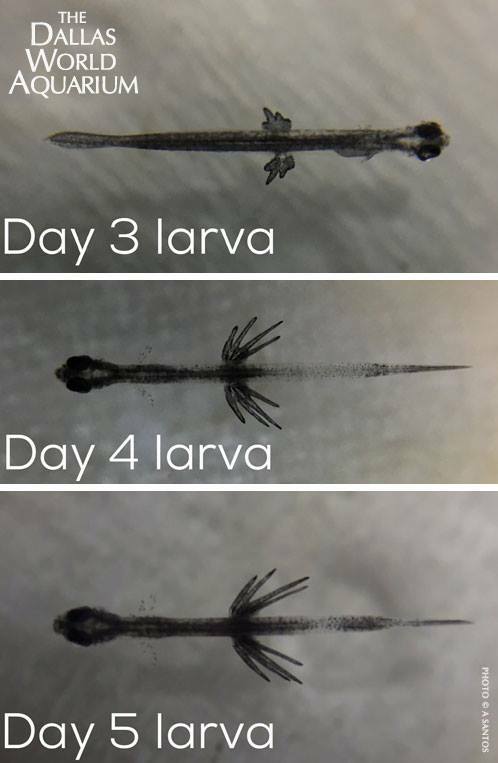 Continued larval development of captive spawned Photoblepharon palpebratus; days 3 through 5 post hatch for a Flashlight Fish. Today, speaking with Paula Carlson, DWA Director of Husbandry, she added that the DWA has been exhibiting flashlight fish for many years under the Direction of DWA owner/Director Daryl Richardson, in cooperation with marinelife collectors and exporters Cairns Marine, based in Cairns, Queensland, Australia. Carlson expressed cautious optimism, qualifying the Aquarium’s success, noting, “[We are still] very early in the learning curve.” She elaborated, providing more details and reasons to be hopeful. We look forward to sharing updates as they become available. Editor’s Commentary: For most aquarists, simply keeping Flashlight Fishes is challenge enough. 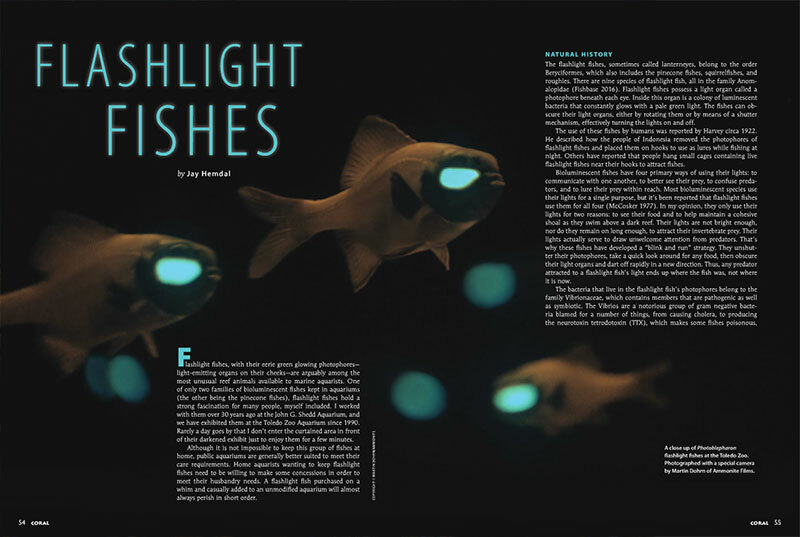 To that end, quite coincidentally, curious hobbyists can read more about these amazing reef animals in the current January/February 2017 issue of CORAL Magazine, where veteran public aquarist Jay Hemdal reveals the pitfalls and secrets of keeping Flashlight Fishes in captivity. “A flashlight fish purchased on a whim and casually added to an unmodified aquarium will almost always perish in short order…Home aquarists wanting to keep flashlight fishes need to be willing to make some concessions in order to meet their husbandry needs.” Learn how to succeed with this comprehensive guide, “Flashlight Fishes,” by highly-experienced public aquarist Jay Hemdal. Read more in the Jan/Feb 2017 issue of CORAL Magazine. Don’t get CORAL? Subscribe now!